Home iPhone 5s NaMo Smartphone Smartphone used by Mr Narendra Modi? Smartphone used by Mr Narendra Modi? Have you ever wondered what is the smartphone Mr Narendra Modi the latest PM of India might be using? If he actually uses any? Well to put your curiosity to rest a premium person uses a premium brand smartphone. No surprises in here its an iPhone 5s. In one of the rare occasions when Mr Modi was spotted with his cell phone just after casting his vote in 2014 general elections. 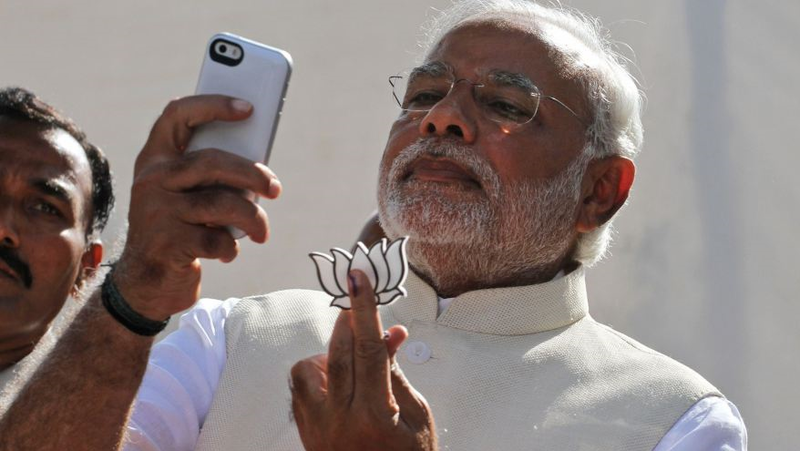 Below image clearly shows Mr Modi using the iPhone 5s to do What's App with his Party group. It seems the Aoki bar Modi Sarkar slogan was originated from this cellphone. Well done Mr. Modi and congratulations for getting India's top job. The country counts on you.